Dogs and Cats Living Together... Mass Hysteria! I’ve finally got my hands on the missing link, the second Urusei Yatsura movie, Beautiful Dreamer. Technically the whole 190-episode TV series is missing in action, never having seen a UK release. But of the ancillaries, the OVA episodes and the six movie spin-offs, MVM released everything but this movie in the UK, and I’ve had those in my collection for years now. Beautiful Dreamer was the sole aspect of Urusei Yatsura whose rights are owned by Toho, so when it came to US licensing, while Animeigo got everything else, Central Park Media got the second film, and by the time I got savvy to importing, Beautiful Dreamer was out of print and long gone. Then earlier this year, Discotek Media rescued the licence and gave Urusei Yatsura its first HD airing in the US. The Blu-rays being locked to Region A, I had to settle for the DVD, but even that is in another world compared to the MVM releases of the other movies. 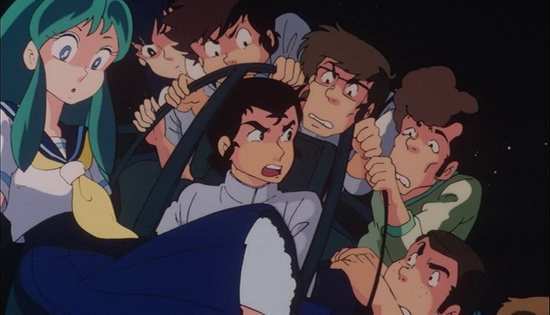 Urusei Yatsura told the story of one Ataru Moroboshi, eternal lecher who somehow got engaged to an alien girl in a tiger-stripe bikini, and all the mayhem that ensued. Ataru loves to go ‘girl hunting’ and his fiancée punishes him by delivering electric shocks, otherwise she’s utterly devoted to him, something that raises the ire and jealousy of his schoolmates. That’s pretty much all you need to know. 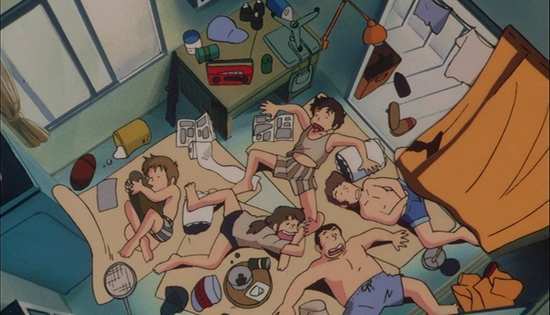 The second feature film spin-off catches up with Ataru, Lum, and the students of Tomobiki High School as they prepare for the School Festival. It’s a crazy rush to get everything finished on time, with everyone staying late into the night before the festival starts. Class 2-4 are preparing the Third Reich Cafe, but the Leopard Tank in the classroom might have been a bad idea. And the next morning they wake up and resume preparing for the Festival, which will start the next morning. Something isn’t quite right. The day starts repeating itself, the preparations for the never to begin School Festival seem endless, until the town begins to empty, the streets clear of traffic, buildings start to fall into ruin, until all that’s left are the members of Class 2-4. What’s going on, and who cares when they’re all having so much fun? 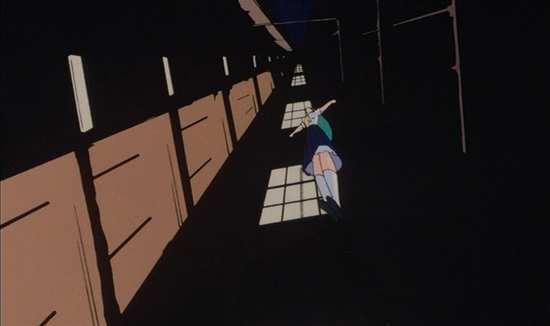 The Urusei Yatsura movies were animated in open matte format, a 4:3 frame, and then matted to 1.85:1 for theatrical presentation. Animeigo and MVM released the other five movies as full frame 4:3 and I believe that’s how CPM released Beautiful Dreamer as well. For the Discotek release, they’ve gone for the theatrical widescreen format, showing the film as it was seen in cinemas. That’s 1.85:1 or rather around 1.75:1 anamorphic NTSC, and it’s encoded progressively on this disc. The image is clear and sharp, there are no visible compression artefacts or aliasing, and the animation comes across well. The print is clean and stable, and about the only issue is that the image is a little dark. You’ll have never seen Urusei Yatsura look this good before, and it must look spectacular on Blu-ray. Having said all of that, this is Urusei Yatsura, an animation from 1984, a film spin-off from a long running TV show with simple character designs and an easy to replicate world design. This isn’t the most stunning anime ever made, although this feature film does offer it a wider scope for imagination and creativity, as well as referencing a whole heap of Toho licences. Godzilla makes more than one appearance in this film. You have the choice between DD 5.1 Surround Japanese, the DD 2.0 mono English dub, the original DD 2.0 mono Japanese track, and a DD 2.0 mono restored Japanese track (probably the surround down-mixed). I was happy with the surround experience, which remains authentic to the original mono by keeping things front and centre, but gives the film a little more room to breathe by just broadening the soundstage. It never sounds artificial or contrived. I checked on the dub to see if it exists (it does), while the difference between the two Japanese tracks was one of cleanliness and clarity. The subtitles are timed accurately and are free of typos, but for some reason couldn’t handle the Yen symbol. You get one disc in an Amaray case, enclosed in an o-card slipcover that repeats the sleeve art. There’s some nice art on the inner sleeve. The disc boots to an animated menu. The peach of the extras has to be the commentary with director Mamoru Oshii, which was recorded in 2003 for the CPM release of the film. As was their approach, it’s in the form of an interview and it’s well worth listening to. Finally there are 10 pages of production notes for the series, and the film, as well as some translation notes. I may have overhyped myself out of appreciating this film. 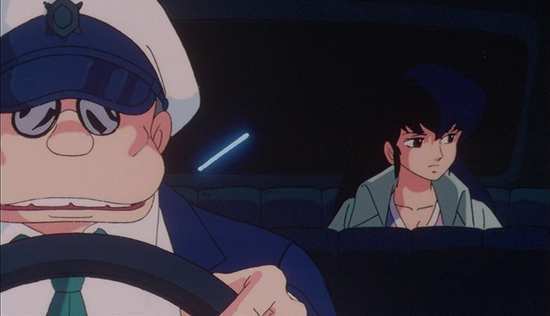 While I’ve watched the other five films on several occasions, Beautiful Dreamer has long been described as the best of the Urusei Yatsura films, so good that it transcends the franchise. 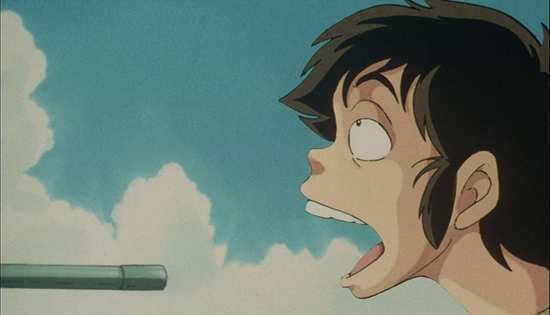 Mamoru Oshii, better known for Ghost in the Shell, learned his craft on the Urusei Yatsura TV series, and he directed the first two movies as well. Beautiful Dreamer was the most esoteric he got with the franchise, presaging his later, more seriously minded work. This much is true; Beautiful Dreamer is the best Urusei Yatsura feature film by far. It’s just that in the grand scheme of things, Beautiful Dreamer is not that great a movie. It’s just another instalment of the franchise that sees Ataru Moroboshi eternally fantasising about girls, trying to chat them up, and getting zapped by Lum for his transgressions. 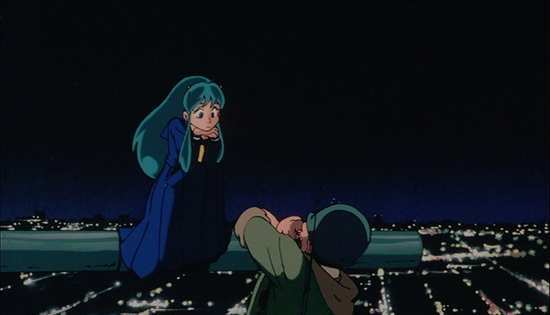 The first film was all about Ataru’s supposed engagement to another alien girl, and what transpired when she kidnapped him to finally tie the knot. There was a whole lot of space travel, alien worlds, and bizarre creatures for the characters to encounter. For the second film, Mamoru Oshii wanted instead to concentrate on the human characters, and a real world setting. Thus the only aliens to appear in this film are Lum and Ten-chan. 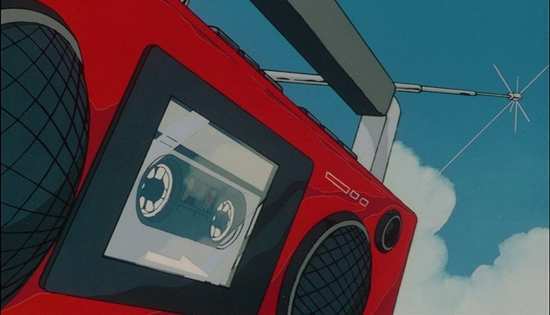 It also makes the bizarre events of the story all the more effective if you have a realistic base to start from, so the students preparing for the school festival is an event that anime fans will be familiar with. You can instantly date the film by the fact that making jokes about Nazis is still funny, hence the Third Reich Cafe. The preparations for the event all get a bit Groundhog Day, with variations on tank panic in each iteration. 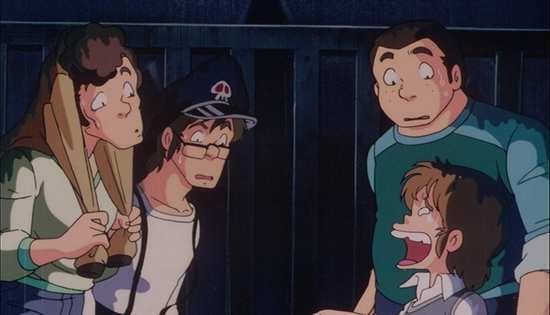 Once the students realise that something is going wrong, the movie also presages Star Trek TNG’s Remember Me episode, and sees elements of the world start falling away, until all that’s left are the members of Class 2-4, Ataru’s parents, and a couple of other adults. The world becomes some sort of cast-away paradise, all summery and relaxing, and solving the mystery becomes less important than having fun, for at least one of the ‘castaways’. The clue’s in the title of course. The second Urusei Yatsura film is about dreams, about wanting to live in a perfect world, and it seems someone’s dream has become reality. Mamoru Oshii really does go to town with the dream imagery in this film, with more than one fantasy vision depicted (one particular sequence, Ataru in his harem would go on to be reused in a subsequent film), and this actually turned out to be the one problem with the film for me. All this mind-bending, alternate reality had a soporific effect on me, and I found it hard to keep my eyes open. It’s like that repetitive sequence with the puppets in Ghost in the Shell Innocence, the midpoint of that film that always puts me to sleep. Urusei Yatsura: Beautiful Dreamer is a film that’s best served by watching it during daylight hours fortified by caffeine, lest it induces beautiful dreams in you.